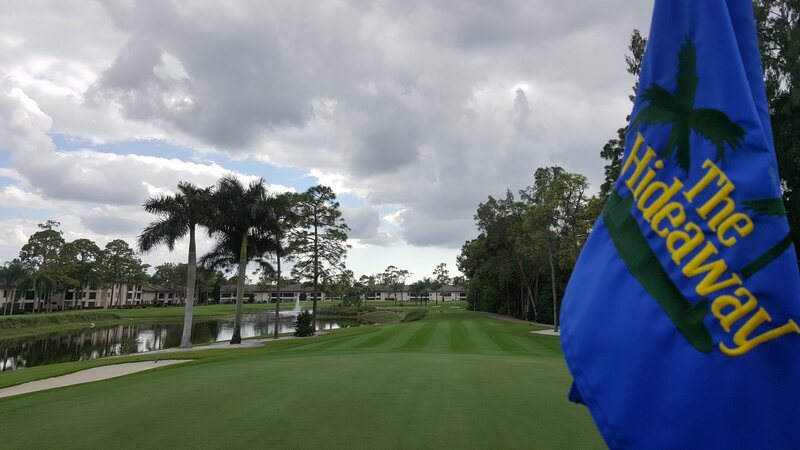 Rolling fairways, lakes, and woods wrap around the five residential villages that make up The Hideaway Country Club creating a genuine hideaway in the heart of Southwest Florida. The 496 condominium units are divided into five separate villages. Each village is run by a five member board of directors, as well as professional management companies. During the winter season, the social committees in each village plan weekly get togethers along with monthly themed parties. Home to a diverse population of condo owners seeking the comforts of living in Southwest Florida. Each of the 72 units has a view of our award winning golf course and perhaps even a peaceful pond featuring a lovely water fountain. Our common grounds include a newly renovated pool adjacent to a patio that provides the venue for various planned activities or just lounging under the palms with friends. Baltusrol's 7 buildings and 86 homes, (or homes away from home) are filled with fun loving, active and involved, friendly people. We count on each other for many things; for exercise at the pool, friends to walk with, friends to golf with, for happy hours, where we share our thoughts on so many subjects. Every month we share a themed patio dinner, which continues to delight us with so many of our residents' epicurean specialties. Our owners are a group of diverse individuals, from many walks of life and areas of the country but with one common goal - having fun and enjoying life. Whether a snowbird or a year-round resident, new owners feel at home from their first day. During season, the social committee is very active, planning weekly get togethers and monthly parties. Food abounds, mixed with laughter and a sense of family. Where living among friendly people is a contentment and joy of life. Everyone pitches in for optimal outcomes. The Social Committee finds ways to make our Thursday night happy hours the ultimate in entertainment. The Landscaping and Maintenance Committees go far and beyond the duties expected to beautify our Village. The largest of the five Villages in The Hideaway, is also the newest (built in the early 90's). Consisting of 10 two-story and 2 three-story buildings, there are 152 condominiums in our Village, all with great views of our beautiful golf course. Most of our residents are passionate about golf, many about tennis, but everyone shares the universal love of Fort Myers, The Hideaway, and Oakmont Village. Renting a condo is a great way to get to know The Hideaway. Many renters become owners after enjoying the amenities and sense of community. Contact a local realtor for annual and seasonal rental opportunities. Estoppel requests should be emailed to controller@thehideawaygolf.com. Questions can be directed to 239-275-6232 ext. 104.